Home care workers and clients kicked off the campaign for a new contract covering more than 20,000 workers statewide in September. After negotiations that took nearly four months to conclude, home care workers are poised to vote on a tentative agreement for a new union contract with the State of Minnesota that would raise their wage floor from $11 to $13. 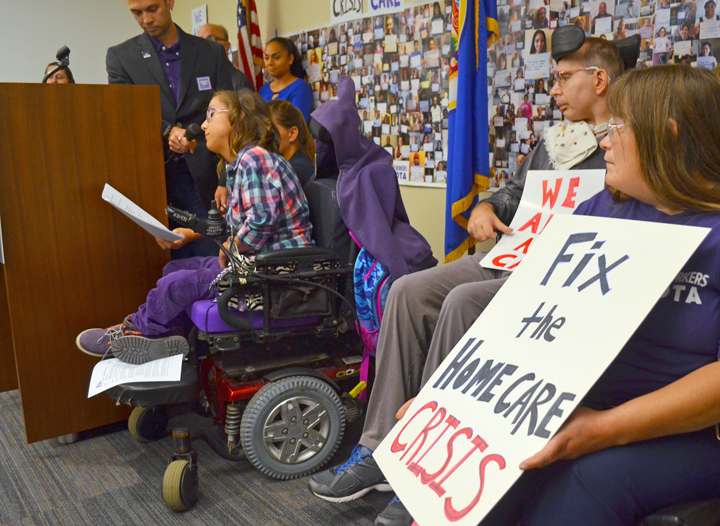 The home care workers’ union, SEIU Healthcare Minnesota, announced the tentative agreement in a press release today, calling it a critical step toward addressing a growing workforce crisis in the state’s home health care industry. A $2-per-hour increase in the wage floor, to $13 per hour hour, and additional increases for workers providing support to clients with the highest, most complex care needs. Investing over $1 million in training for home care workers, and new stipends for workers who access the training sessions. Holiday pay – a first for Minnesota home care workers, many of whom provide essential care on holidays, allowing their clients to celebrate with family. Increased paid time off, a benefit won in SEIU’s first contract with the state two years ago. An online matching registry to help home care clients find workers and vice versa. The contract negotiations impact more than 20,000 workers who provide state-subsidized, in-home care to disabled and elderly Minnesotans. The workers voted to form a union in August 2014. If ratified by union members, the tentative agreement would advance to the Legislature for approval before reaching Gov. Mark Dayton’s desk. As they did in negotiations two years ago, SEIU members invited several home care clients to join the union’s bargaining team. Jim Carlisle, a disability rights advocate and home care client who served on the bargaining team, said the tentative agreement provides an opportunity for state lawmakers to address increased demand for workers who provide in-home health care as Minnesota’s population continues to age. The state’s Department of Employment and Economic Development projects nearly 38,000 new openings for home-health and personal-care aides over the next 10 years – jobs likely to remain open unless wages and working conditions in the industry improve. “My wife and I have seen the best of home care workers, some of whom became like family to us,” Carlisle said. “But we’ve also experienced the trauma that comes when there are not real investments in care work.